Leadership speakers advise leaving your audience wanting more. Leadership speakers remind us that public speaking is a fundamental part of many jobs. Whether you need to engage your employees, persuade a committee to fund you, to sell your product or to educate, the fundamental things that make you a good public speaker will be the same. Self-belief will make you more confident and therefore people will be more willing listen to and trust what you say. After all, the first step to getting others to believe in you is to believe in yourself. Make sure you know your topic inside out. Yes, it may be time-consuming and hard work initially, but “winging it” is not an option. If you are unprepared, you are far more likely to stumble or lose your place and consequently your confidence and authority – best to avoid! Everybody likes to laugh and this will relax and settle both you and your audience. However, be warned, too many jokes may take away some of the validity of your talk – use in moderation! Leadership speakers remind you not to mistake yourself for a stand-up comedian. It’s true. We’re all only human and that’s okay. Chances are, your audience won’t even notice if it’s just a slight change of word or phrase. However, if you feel it was a very obvious or important mistake, acknowledge it, correct yourself and move on. 5. Keep it Short and Sweet! Leadership speakers tell you that it is much better to leave your audience wanting more rather than send them to sleep! Everyone makes mistakes. As professional speakers say, don’t apologize for them. Continue your speech and don’t break the flow. As all professional speakers know, stuff happens during presentations. These real time events require a quick wit and are necessary to prevent the collapse of your presentation. In fact, your presentation just might have gotten a little better if you handle them smoothly enough. The point is, that the show must go on and little disturbances shouldn’t be made any larger than they really are. They’re bound to happen. Mistakes can come in any form and size, but a good public speaker can handle them all. Several professional speakers state that you should never apologize, and for good reason. Apologizing for technological difficulties or an error you made in information puts the mistake in the spotlight. This is awkward for everyone and the best solution is to use humor. Using humor makes light of a bad situation and can reset the flow of your presentation. If the lights go out suddenly, just blow it off with a light joke – “I guess it’s closing time.” – and continue with what you were saying. This is part of the show, after all. You can’t just talk for an hour and a half and expect the crowd to be silent. There’s no way to expect what they’ll ask so make sure you’ve mastered your topic. Don’t make your answer too long as there are other people who have something to ask. Remember, your answers are from the top of your head, but you are still a public speaker; don’t sink back into a casual way of speaking and absentmindedly hmm or umm. It’s important not to panic as it just exaggerates the errors made. Trust the experience of these professional speakers; these tips were made to ensure that you maintain the flow of your presentation. Convention speakers have a lot to teach but it’s best to go up to a mic and practice your own techniques. Develop your own style to capture the eyes and ears of your audience. Project your voice: There are probably a lot of people attending your speech – your crowd. You won’t always have a microphone, so it’s important that you project your voice all the way to the back so that everyone is on the same page. Speak clearly: They can’t just hear you; they have to understand you, as well. Don’t slur; proper diction is important when you want to get your point across. Emphasize key words: This is to show importance in that term. Emphasizing key words is a technique for getting the crowd to remember the idea of your speech. Explore the stage: Staring at one spot for the whole duration of a speech is boring and members of the crowd might be tempted to look away after a while. Move around so their eyes have something to track. Move your hands: Make expressions that go along with what you say. It catches attention and keeps the crowd interested in you. Becoming a great public speaker doesn’t happen over night, so it’s good to grab all the opportunities you can get to practice before a real audience and accumulate experience. Before you know it, these techniques will become natural and you’ll be just as charismatic as other convention speakers. For more information on Andy’s programs, contact us today. Sign Up for Andy's eZine! Professional speakers are very knowledgeable about the fears of public speaking; they’ve been through it, too. All eyes are on you, watching your every move. Every public speaker has felt some form of stage fright, even a professional speaker would admit to that. Whether it be the fear of making errors or shyness, there’s always a way to get over it. What people miss about public speaking is that it’s not about making a perfect word-for-word recitation of your written speech, it’s about getting your point across to an audience. They’re not listening to witness how great you are at memorizing, but listening to learn something. Get your point of view across, not your word count. This need for unneeded perfection is the most common source of anxiety and here’s how to control it. The reason for creating a speech is to have a guideline on what to say and in what order. There’s no need to take it to the extreme and imprint every word in their exact order into your head. Mastering your topic is a lot easier and more useful as you’ll never run out of things to say and you won’t need the speech to tell you what to say. If you know the topic like the back of your hand, you can ad-lib easily and not worry so much about your guidelines. A professional speaker doesn’t mind his speech when he’s on stage because he doesn’t need to and neither do you. The people you’re speaking to aren’t judges; it isn’t American Idol. You won’t be booed because of little mechanical mistakes and they don’t have a criteria to base your speech on. Besides, you’re the only one who has a copy of your speech so how will they notice the lines you left out or the words you didn’t say? Just relax and be moderate: over-practicing just causes stress. Give your voice and eyes a rest, preparing your mind and body for a speech is just as important as performing well. Fear and anxiety are mostly self-created so don’t stress yourself out about the little things. Use the advice of a professional speaker and be more prepared and more confident when you get on stage. To learn more on Andy’s programs contact us today. Sign Up for Andy's eZine! A business keynote speaker suggests that connecting with your audience makes getting your point across a lot easier. This could be done in a number of ways. If you’re in a state or city with a sports team, wear the team’s jersey. Crack a few jokes at the beginning of your show. Be polite in how you speak. Generally know your audience and do what they like. The more they like you, the more willing they are to listen and agree with you. Set yourself apart from other public speakers. Even if they like you, your message will only last as long as they remember you. You must change what they think about you from “another public speaker” to “that great public speaker.” Be eye catching and energetic, someone that gave them a great time for a few hours. Associate your presentation with an emotion or feeling so that whenever they feel that way again, they’ll remember what you said. The utmost mission of a public speaker is to leave a lasting impression on their audience. They came to change their lives a little bit, change their perspectives even an inch. Being the crowd favorite is not an easy job and it won’t always happen. It’s all right if you didn’t connect with them as much as you hoped to, putting the effort to try makes all the difference in the impact of what you had to say. 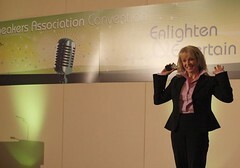 Try the business keynote speaker’s suggestions and bond with your listeners on a higher level.